Hong Kong-based Bondwell purchased home computer vendor Spectravideo in 1984. 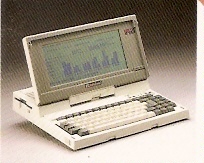 In 1985, Spectravideo changed its name to Bondwell and switched from making home computer systems to CP/M and PC-compatible desktop and portable computers. Bondwell’s laptops were relatively inexpensive, and examples frequently pop up today. Sold primarily as a word-processing system, the Bondwell 22 had an odd configuration. The main unit was a half-tower design with a small CRT imbedded at the top that displays the software menu. A standalone monitor is for text display. Because all the Bondwell 22 components are tightly integrated, an incomplete example would be of limited or no use. The Bondwell 12 emphasized compatibility with Kaypro systems. 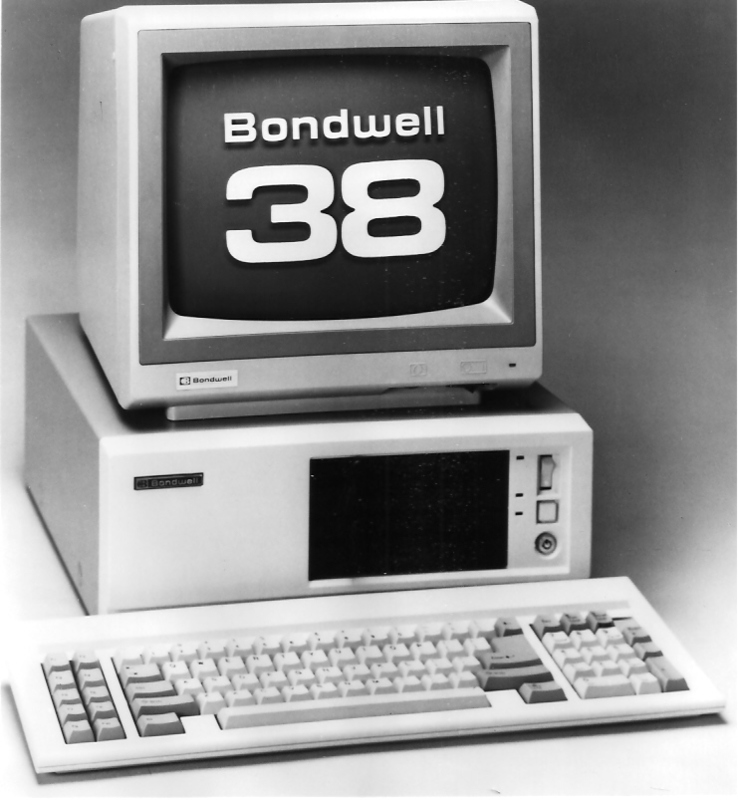 A Bondwell 14 offered dual 360K floppy drives, twice the capacity of the Bondwell 12’s drives. The most exceptional feature of the Bondwell 2 CP/M laptop was its price–less than $1,000. 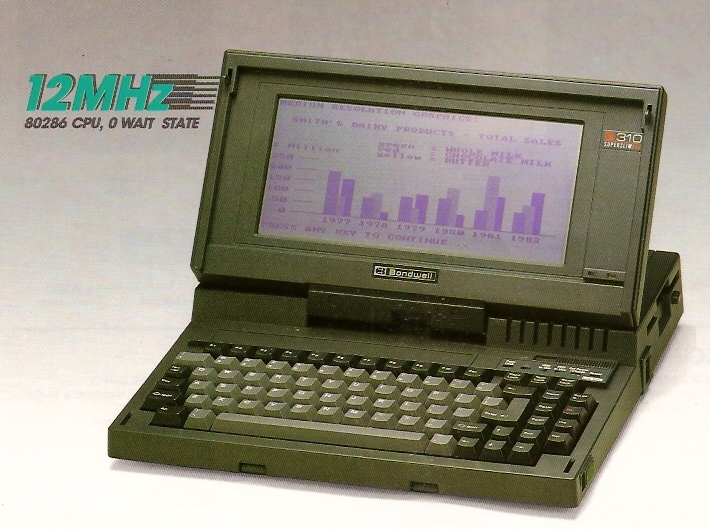 The Bondwell 8 was the company’s first PC-compatible laptop. Although inexpensive, it was a tad heavy for a laptop with mediocre viewing quality on the LCD. 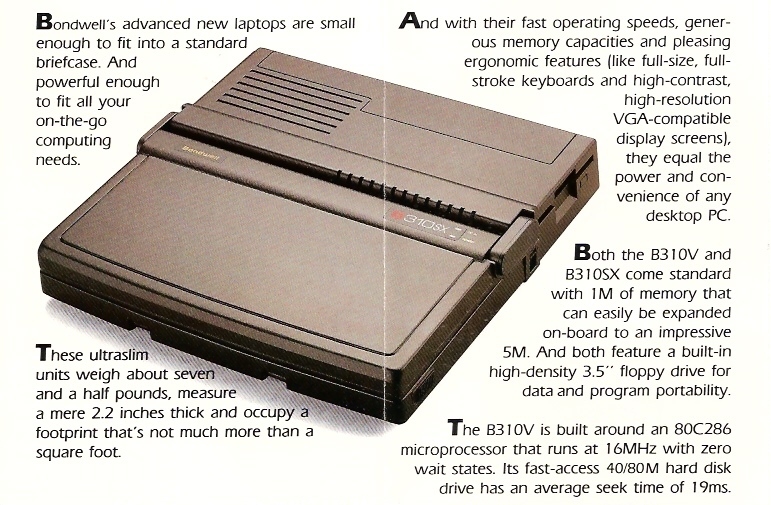 In 1991, Bondwell claimed an unusual first for a laptop computer: a built-in motion detector. It acted as a security device. Unless you typed in a password, the computer sounded an alarm if you tried to move it. My guess is it was more of an annoyance for the owner than a theft deterrent. Size/Weight: 11.2 x 12.2 x 3.1 inches, 11 lbs. Size/Weight: 12.5 x 11 x 3.5 inches, 12 lbs. Size and Weight: 13w x 12.2d x 2.4h inches, 6.9 lbs. Size and Weight: 13w x 12.2d x 2.2h inches, 7.6 lbs. Size and Weight: 13w x 12.5d x 2.1h inches, 7.5 lbs.